Due to the olive oil. nuts and Parmesan cheese pesto does contains a significant amount of fat and therefor is relatively high in calories. However, it also offers many heath promoting nutrients and can be included in a disease fighting diet regularly. In this recipe walnuts are use instead of the more traditional pine nut. Pine nuts are more costly in comparison to walnuts making this a more economical alternative. Another benefit to using walnuts is they contain the one of highest concentrations of alpha linolenic acid found in food. This particular fat plays a role in anti-inflammatory pathways and disease prevention. The basil and garlic also offer an array of unique micronutrients for disease fighting power Most of the calories from the pesto will come from the extra virgin olive oil. Oils made from plants contain molecules called sterols which can bind to dietary cholesterol decreasing their absorption rate. There is also evidence to support their association with increased fat metabolism. As long as calories are not exceeded, including plant oils in moderation such as extra virgin olive oil, can influence positive health benefits. These pesto sauces can be used to top spaghetti squash, zucchini noodles, or even fish or chicken. This recipes suggest the garlic be roasted to elevate the strong bite that can overpower the more subtle flavors of the basil. 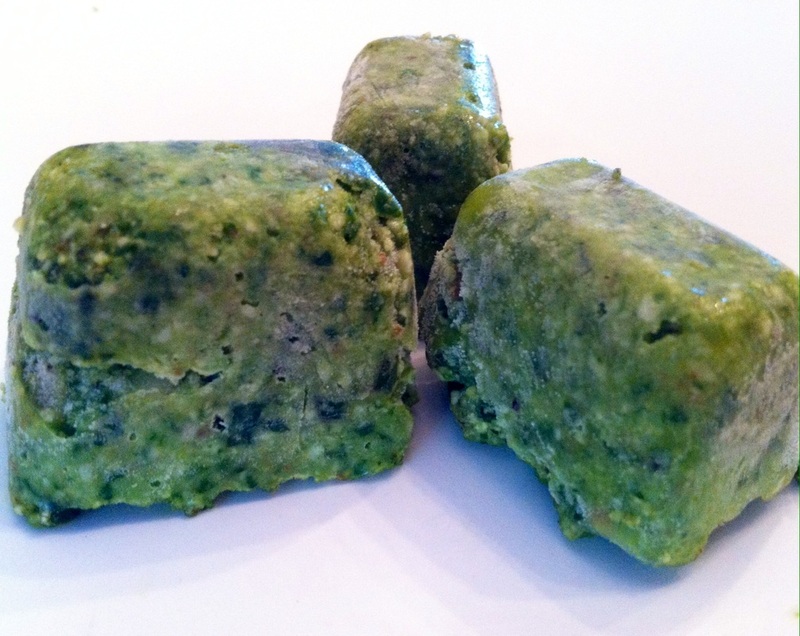 Use the pesto the same day or spoon into ice cube trays and freeze for later use. Once frozen remove from the ice tray and store in freezer bags. Heat 2 pesto ice cubes for each serving in a medium sauce pan on low to medium heat until completely thawed. Directions: Heat the oven to 400 degrees. Place the garlic cloves, with the skin still on, on the cooking sheet and into the oven. Allow to roast until golden brown. About 10 minutes. Combine all other ingredients into the food processor. Be conservative with the salt because the parmesan cheese contains quite a bit. Once the garlic is roasted remove from the oven. The skins will have a golden brown color when they are finished. Carefully remove the outer layer of the garlic. The garlic should be soft and aromatic. Place the garlic into the food processor with the other ingredients. Blend all of the ingredients together until a smooth consistency is reached.